To understand the story of creation. Uncover a mobile phone on the table. Let everyone state their opinion. – Is this world we live in more complicated than a phone? – Are you not more wonderfully made than a phone? – Did you arrive here by chance? – Did you develop out of nothing? Many people believe that you did. The bible says that we have been created by God and that you have been made for a purpose. Read the following from Genesis Chapter 1 verses 1 to 3. In the beginning there was nothing. There were no people, no animals, not even light. Then God said, “Let there be light.” And there was light, day and night. Next God put water in the sea and the sky to make clouds. Then God made dry land with hills and valleys and rivers. That was the third day. Then God put the sun in the sky and made the moon and stars. That was the fourth day. Next God filled the sky with birds and flying creatures. He also filled the sea with fish. That was the fifth day. Then God made animals of all kings and the first man, Adam. That was the sixth day. God was very pleased with what he made. Then he rested. That was the seventh day. 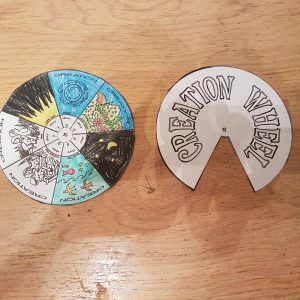 Make a ‘Creation Wheel’ to show the days of creation. Colour in the pictures, cut them out and join them with a split pin. 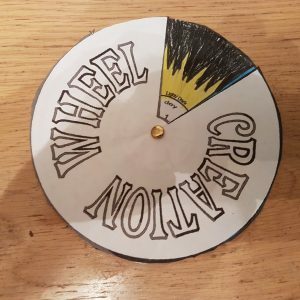 Then re-tell the story using a wheel a child has made. Note. The original template can be downloaded from here.